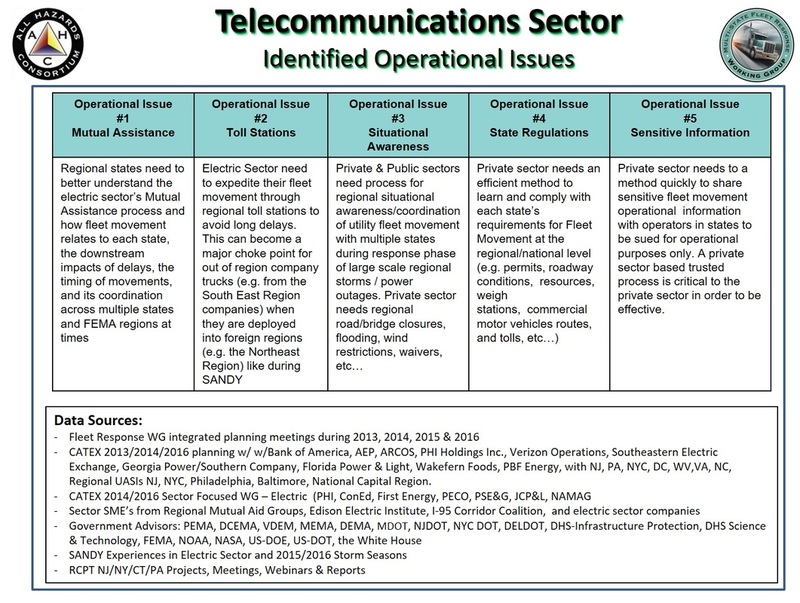 Since 2013, the All Hazards Consortium's Multi-State Fleet Response Working Group (FRWG) has been working with states and companies to develop "real world" operational use cases in order to develop the legal, policy, operational procedures, technologies and solutions that enhance disaster response communications and coordination. 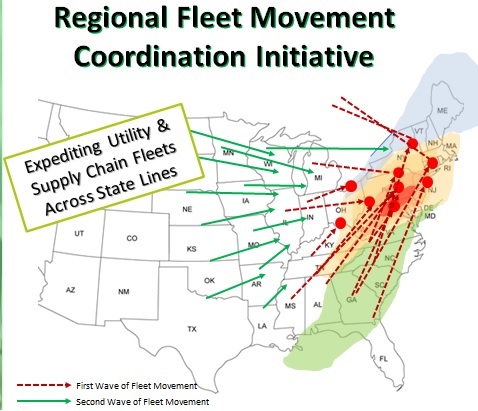 During the FEMA funded RCPGP (Regional Catastrophic Planning Grant Program) that ran from 2008 to 20014, the AHC facilitated several public/private sector exercises which identified "real world" operational issued faced by the private sector during Superstorm SANDY. 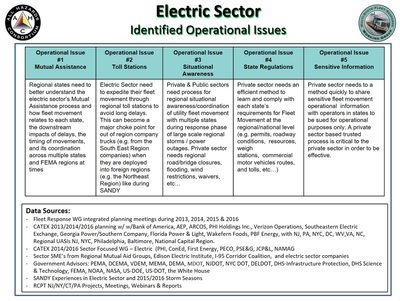 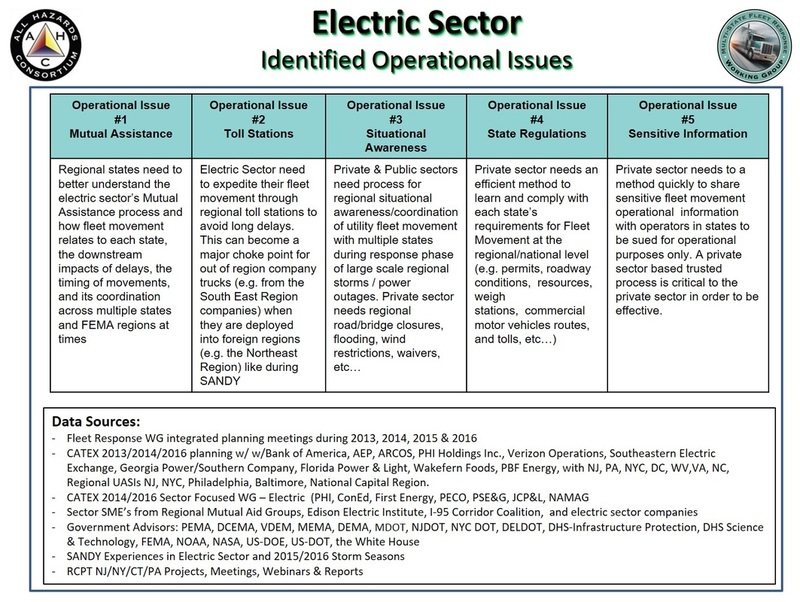 The Electric, Food, Fuel and Telecommunications sector representatives, along with the state and local government participants from the Mid-Atlantic and Northeastern US, help to prioritize and document the operational issues below that needed to be addressed to avoid repeating and problems in the next disaster. 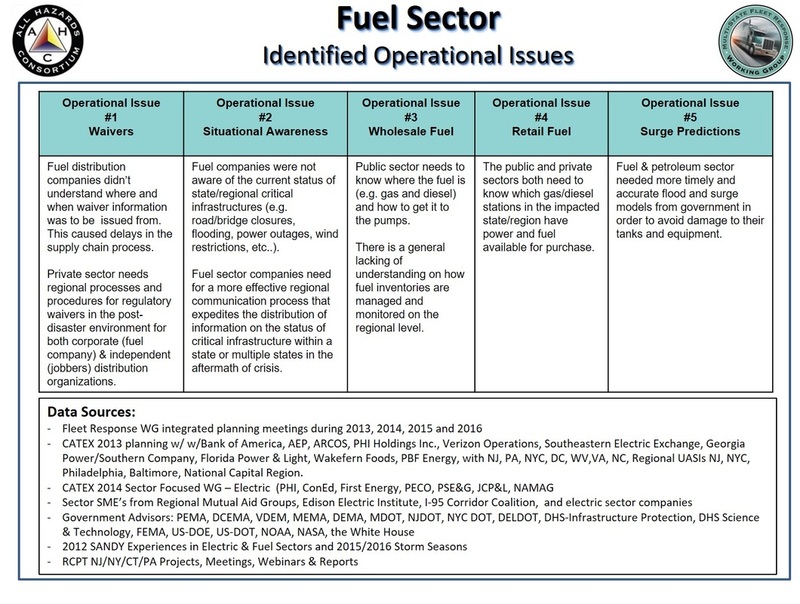 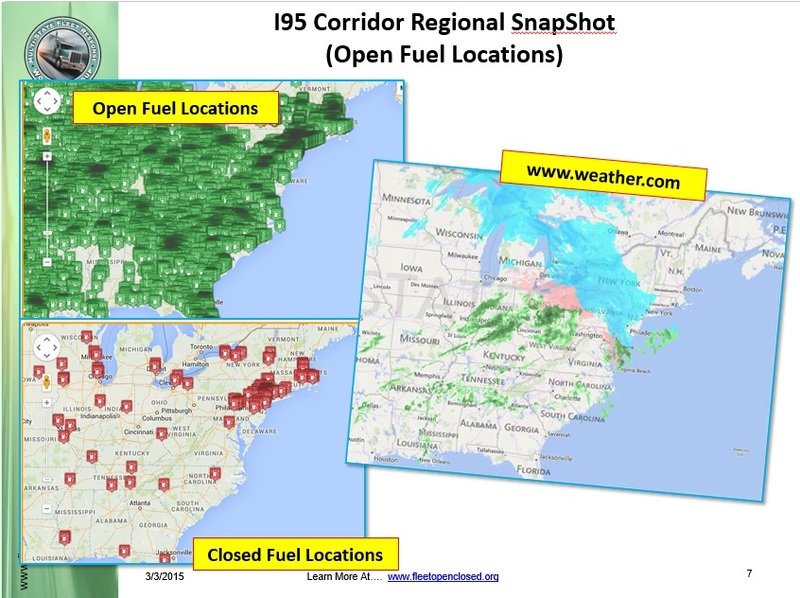 These operational issues provide the basis for the "use cases" to be used in future solutions of the FRWG. 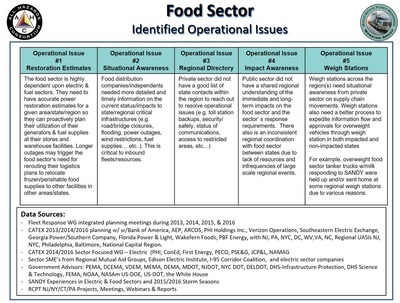 Using the above operational issues, the FRWG and its committees develop "Use Cases" (as shown below) and solutions to address short-, mid-, and long-term solutions that can address the issues. These use cases organize information and people to support decision makers. 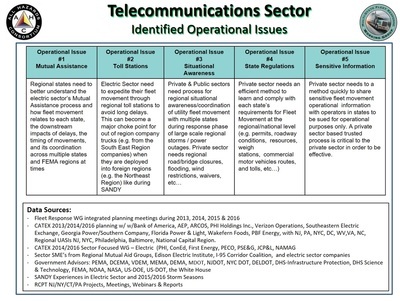 Technology, policy and process then can be developed to allow the sharing of this information is a secure, safe and trusted manner with the SISE (Sensitive Information Sharing Environment). 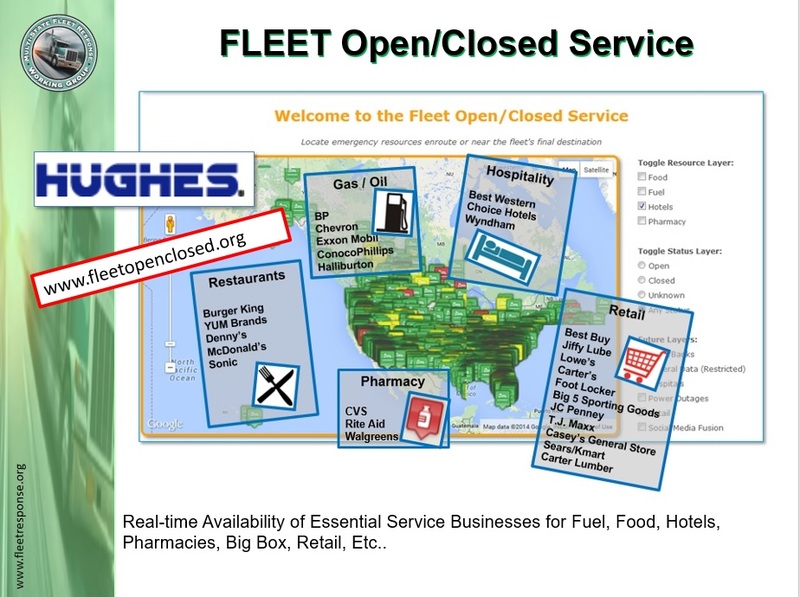 Hughes Network System’s Satellite Dish Status Database of 250,000 locations in the U.S.